Proportional Representation is not just better for democracy, but has associated positive outcomes relating to equality. 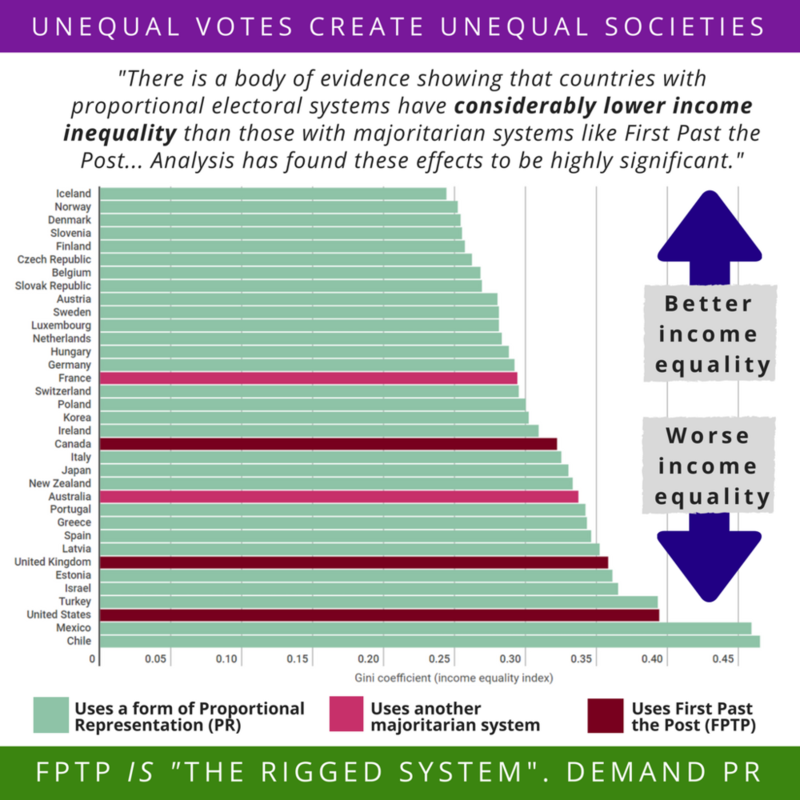 Links between proportional voting systems and reduced inequality have been observed in countries the world over. Countries with PR also tend to have a more equal distribution of public goods. A 2009 study by Carey and Hix found that countries using PR achieved higher scores on the United Nations Index of Human Development, described as “a reasonable overall indicator of government performance in the delivery of public goods and human welfare." First Past the Post has been called "the world's worst voting system for achieving gender balance" in politics (Kuper, 1990). Just 32% of British MPs are women. Numerous studies have found that countries with Proportional Representation produce a better gender balance (Matland, 1998; Reynolds, 1999). Every single country with more than 40% female MP in its primary legislature uses a proportional voting system. In fact, research shows that on average, the share of women elected to parliamentary bodies is 8% higher in countries that use a proportional method of electing representatives. Kuper, Richard (1990). Electing for democracy: Proportional Representation and the left. Worcester: Socialist Society. Matland, R. (1998). Women’s representation in national legislatures: Developed and developing countries. Legislative Studies Quarterly, XXIII, 1, 109–125. Reynolds, A. (1999). Women in the legislatures and executives of the world: knocking at the highest glass ceiling. World Politics, 51(4), 547–572.